Mulberry Lifestyle End of Season Sale is here and it just got bigger with discount up-to 50% on its entire range of Jackets. It is one of the most genuine sale wherein you get to buy Jackets from across categorizes on a discounted price. The post discount products are available at a price range of Rs. 1500/- to Rs. 2500/-. The European Linen Jackets are available at Rs. 2500/-, Velvet Jackets at Rs. 2000/-, Cotton Jackets at Rs. 1800/-. Linen Jackets at Rs. 1500/- and so on. Why wait? Hurry up as the stocks are limited and so is the time. Why should only men get to wear the classy Nehru Jackets? As we launch our Spring Summer 2016 Collection, we bring before you the first teaser on what it is all about. The collection includes Nehru Jackets made special for Women. The Jackets are designed with princess cut to fit every woman’s body perfectly. Our SS 2016 Collection will transport us to a happier, sunnier place where we feel free to express a wittier version of our real selves. The designs of our Nehru Jackets and its colors are inspired by the contrast of urban design and lush vegetation, leading to unexpected color combinations and collections of architecture, travel and nostalgia. The Spring Summer 2016 Collection of Jackets for woman are made using finest quality European Linen procured from J. Hampstead in natural pastel shades like Rose, Peach, Serenity, Snorkel Blue, Iced Coffee and more and can be comfortably paired with formals and informal clothing’s. These colors are selected considering the Spring Summer Pantone 2016 colors shade which transcend cultural and gender norms. India, 27th July 2015: Mulberry Lifestyle, an upcoming fashion label started by Arti Poddar, had successfully launched its online store http://www.mulberrlife.in and Spring Summer 2015 Collection of Nehru Jackets back in January 2015. The company has been making waves in the online retail world for its premium quality Nehru Jackets and is selling to its customers across length and breathes of India. Every jacket made by Mulberry Lifestyle bears the hallmark of quality workmanship. These jackets are made with automatic and semi automatic Japanese machines, using carefully selected fine quality fabrics. Made out of natural fabrics like silk, cotton and linen, and also more vibrant fabrics such as velvet and brocade, the jackets are currently available in over 40 colors ranging from earthy pastels to richer hues. The product listed on the Online Store are now on Sale! We are glad to inform, that we have put the entire range of Nehru Jacket listed on our Online Store mulberrylife.in, on Sale. The sale is titled “End of Season Sale 2015” and attracts discounts up to 50% on our Jackets. The best selling Jackets, from our Spring Collection 2015, attract maximum discount of 50%. These Jackets are made of premium quality European Linen sourced from Linen Club, Jayshree Textile and are now priced at Rs. 3250/- after 50% discount. 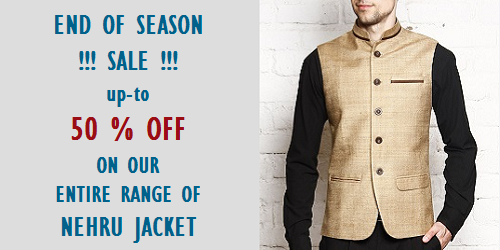 Other Jackets which are made of Silk, Indian Linen and Velvet are also on sale. The Pocket Squares launched earlier this year, is also on sale with a discount of flat 50% and is available in solid colors as well as prints. The sale is across all products listed on our Online Store http://www.mulberrylife.in and can be purchased by customers across length and breadth of India. During the Sale, we will also be providing Free Shipping to our customer across India with the facility of Cash on Delivery where in customer can pay cash at the time of delivery.